I've just passed the 1/3 mark for my story, which I'm very happy about. I really only started cranking down on writing a little over 2 weeks ago and I'm nearing the 30k mark. This also makes me a tad sad, realizing that I could have easily done NaNo had I not switched stories in between. This is okay though. No use fussing about it now. This new idea is better than anything I had written before. Better idea, insane plot twists, hopefully gut-wrenching emotional scenes, and heartfelt family bonds. I'm pleased with the comments I've been receiving on snippets, even though the drafts are so raw, most of which aren't even read through before I post it. So naturally, I'm having plot holes galore right now. It's thrilling, watching my Epic Board 'O Stickies turn into an Epic Wall 'O Stickies. I'll hit that mark soon, but that's the problem with writing and suddenly changing your mind/coming up with a better twist/conflicting plot twists etc...All a part of the writing package. I currently stand at 29k on the fifteen chapter, 114 Word Pages. At this rate, I'll be to my goal by the end of January, which is what I'm hoping for so I can give my friend Kaitlyn the manuscript to keep her entertained while she leaves for a missionary program to Scotland. I wanted to be able to write and do one set of revisions to fill in the holes before I give it to her, so writing, writing, and more writing is in store. As a last little humorous note, I decided to post the screenshot I took after I updated Twitter. I use the web program Google Chrome, finding it more useful than Mozilla and Internet Explorer, but I've come to realize that it likes to imitate Microsoft Word and correct misspellings for me. 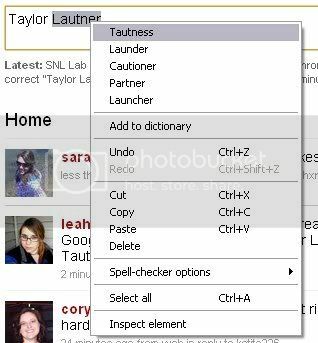 Taylor "Tautness". Yeah, I pretty much fursploded while reading it. It catchy and it applies. And well done with your wordcount! You GO girl!